We’ve spent the past 30 years developing an extensive range of the highest quality supplements available, created to meet the nutritional needs of each individual. We’ve used our expertise, constant research and the best possible ingredients to develop new formulas and extremely effective nutritional solutions that can offer you the additional support you need to keep you healthy every day. Multinutrients – An essential supplement for a healthy diet, multinutrients or multivitamins, feature the right mixture of vitamins and minerals that help your body function at its best. Choose from various solutions including liquids, capsules or tablets made from high quality raw ingredients with minimal additives, making them suitable for sensitive individuals. Minerals – Our mineral supplements, formulated for maximum absorption, can help you get all the minerals you need. Choose from different varieties of magnesium, calcium, iron, zinc, selenium, chromium, molybdenum, copper, manganese and iodine. 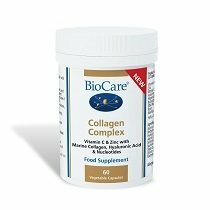 Vitamins – What makes BioCare® vitamin supplements different? We use the innovative Nutrisorb® and BioMulsion® technologies to create vitamin supplements in liquid form, for optimal absorption. However, if you prefer capsules or powders, we have those too. Probiotics – Opt for our award-winning probiotic supplements that are potent and effective. Many of our products use the unique LAB4 complex of bacteria which has shown in studies to have enhanced effectiveness in the gut. We’ve also developed probiotics for children so you can easily take care of your entire family, as well as providing you with dairy-free, vegetarian and vegan alternatives. Antioxidants – These molecules play a very important role in supporting the immune system by neutralising free radicals and protecting other cells from the damage caused by them. 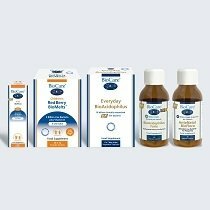 Antioxidant supplements from BioCare® are available as capsules, liquids, powders and tablets. Fatty Acids – Whilst certain types of fat can have a negative impact on your health, essential fatty acids also known as EFAs, are the ‘good’ kind of fat which should be a part of your daily diet. Choose from a varied range of fatty acid supplements available in various, highly absorbable and pure formats. Enzymes – Keep on top of your digestive health with the aid of digestive enzymes that ensure food is effectively broken down for absorption. All BioCare® enzymes are suitable for vegetarians and vegans, so everyone can get the nutritional support they need for a healthy digestive system. 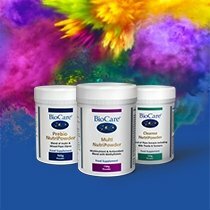 Every single BioCare® product is carefully created using only the best possible ingredients and stringent production processes which ensure that we provide our customers with excellent quality. Learn more about our product ranges by browsing the sections available below. Once you’ve added everything you need to your cart, simply place your order online and remember – we offer FREE delivery on orders over £25 and same day dispatch if you order before 2pm.